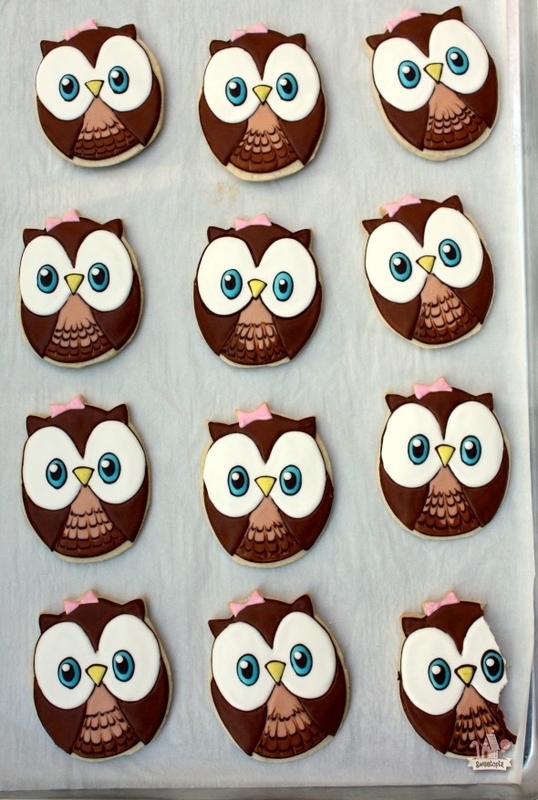 It’s hard to believe it’s already been almost 2 years since I’ve made these little owl cookies for my niece’s 1st birthday party. I had been meaning to make a how-to video on them, but had experienced a little trouble with the files so kept putting it off. After fiddling with the files one last time, I realized that the video wasn’t happening, but luckily I had taken photos of all the steps, so I’ll share them with you below if you’d like to give them a go. 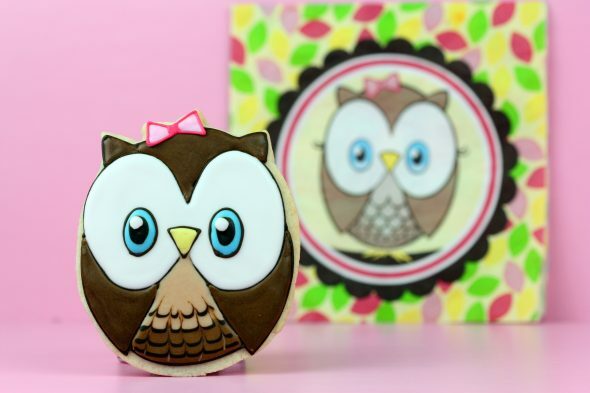 My lovely sister-in-law, Julie, planned an adorable Look Whoo’s Turning 1 party for my sweet niece, Ella, and I was thrilled to make little owl cookie favours. Straightforward to make with a few key tips, and in my drawing-challenged case, with a Kopykake projector. If you’ve got some talent in the drawing department, you may not need the projector as the shapes are fairly simple, but for those of you that may need a little help, or if you’d just like to be able to make your designs faster, I’ve found a site with the best Kopykake projector prices around, on Madison Art Shop! The adorable owl character is based on this party line here . It would be fun to hear if you’ve seen or made these too – let me know in the comment section below! 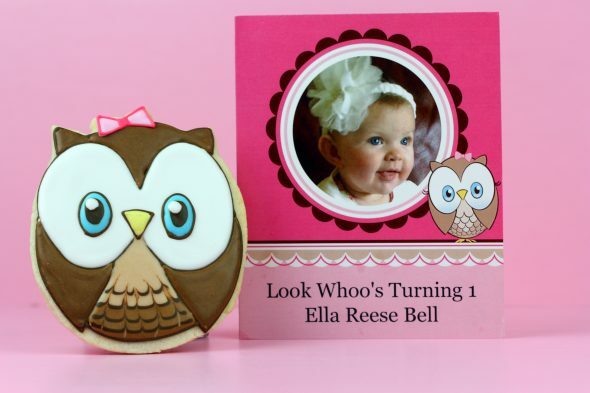 Look Whoo’s Turning 1 Party Pack found here . You can find the recipe for the dough here. 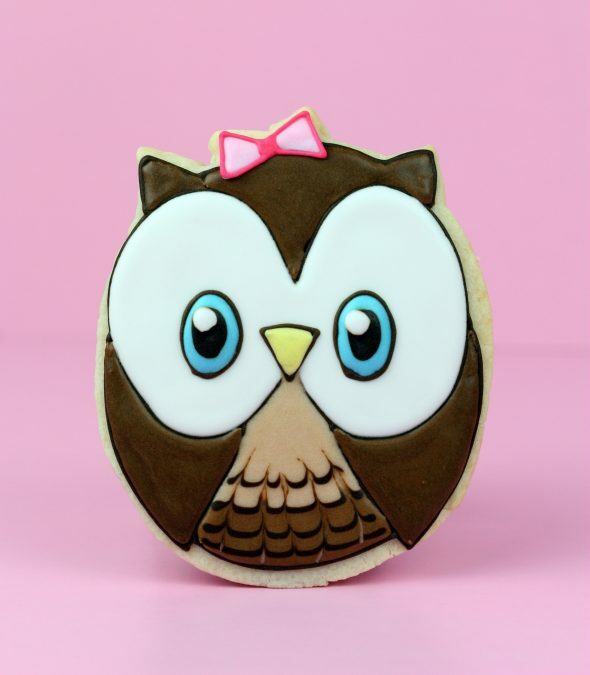 Using this owl image , I made a paper template of the cookie size I wanted, and cut the dough shapes out with a paring knife. Gel Colors (I used Americolor chocolate brown, lemon yellow, sky blue, soft pink, black and white). Step 1: Project your image in the Kopykake projector (tutorial here). 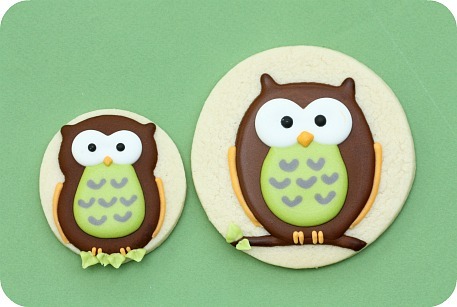 Outline the owl shape with royal icing (#2 tip). For detailed decorating tips, this tutorial may be helpful for you. Step Two: With the same icing, flood, or fill in the darker brown sections of your shape (Use a #3 tip to flood faster). Let that base dry for at least 6-12 hours. Step Three: Using a #2 or #3 tip, fill in the eye sections with white royal icing. Let them dry for at least 6-12 hours. 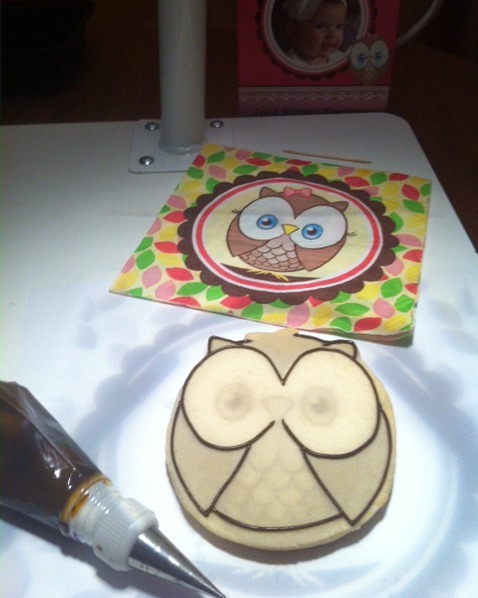 Step Four: Using brown icing and a #2 tip, pipe the outlines of the owl beaks and eyes. Let them dry for a few hours. Step Five: Flood the eyes first with blue, then immediately layer with black icing for the pupil, as well as a white dot of icing on top. Fill in yellow for the beak and pipe a small pink bow on the owl’s head. Step Seven: Using a #1 tip and bright pink icing, pipe an outline on top of your bow base. Let your cookies dry and you’re done! One thing to note, I ended up going a little bit too dark with the brown I think. I’d lighten the icing up a bit next time, either by adding more white icing to the brown icing, or by adding a dollop of brown icing to some white. Another thing to mention, watch out for sweet-seeking, four-legged friends, if you happen to be photographing cookies sitting on a bench, and happen to leave for a few minutes to answer the phone. Can you see which one my Lionel got a hold of? Thank goodness I made extra. I didn’t end up getting many pictures of the cookies at the party, but did snap a photo of Ella enjoying her smash cake. 🙂 (The actual cake was made by Bake Me a Cake). Sweet thanks to Niner of Niner Bakes for editing and re-sizing my photos; she did an awesome job with them, as the lighting was pretty bad (an on-going struggle for me with food photography… still learning!). For pics between posts, join me on Google+, Facebook, Twitter or Instagram. 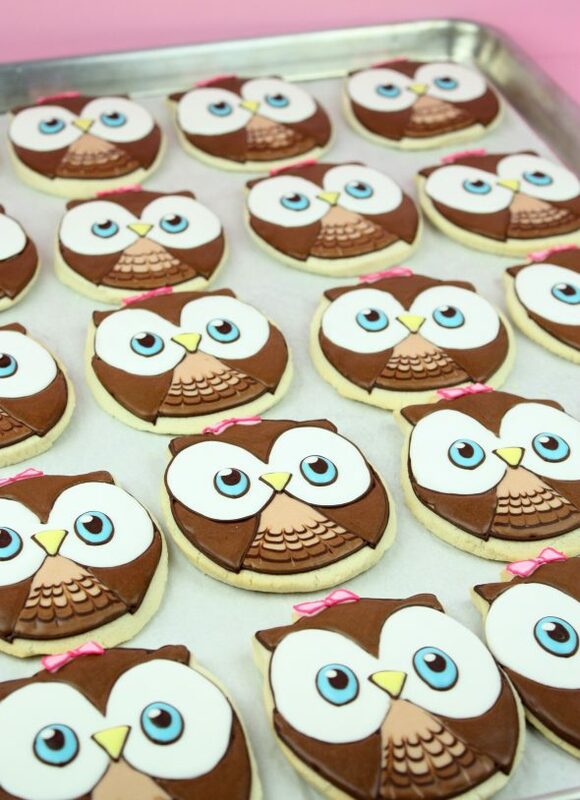 I absolutely LOVE these owl cookies! Your blogpost made me smile this morning before starting with work. Excellent start of the day! Wishing you a sweet start into the week, my dear. Happy Monday Marian love love these cookies. Always a great pleasure reading your blog, you inspire me always. Have a blessed and successful week. These turned out so cute! I especially love how you used the marbling technique for the feathers on the belly! Awwwwe those are so adorable, love the pink bow. Have a great week! These owls are fantastic! Looks like Ella really enjoyed her party! You too, @ Rowaida Flayhan! 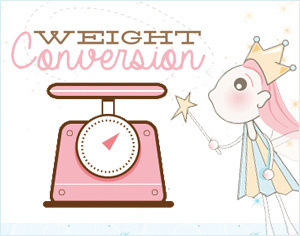 Thanks, @ Janine – sugarkissed.net! Super, thanks so much, @ brantcookies! Thank you for always sharing all that you do with all of us! 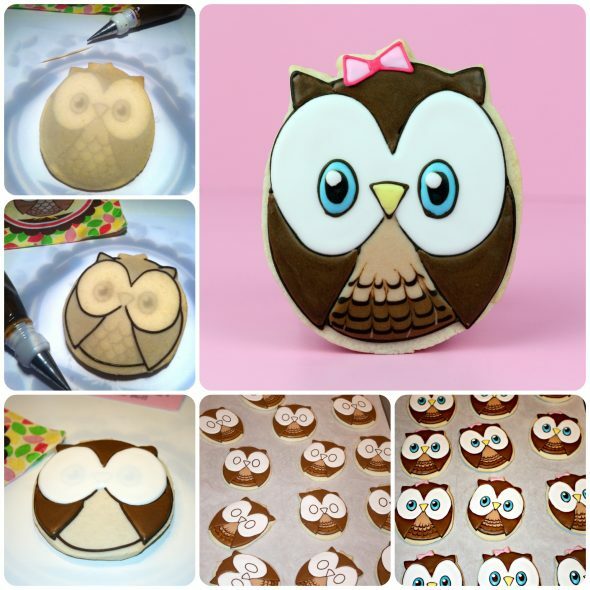 love your owl cookies…. and Ella with Mom are very pretty. I’m sure your Lionel had a great time stealing a big bite…. Oh my goodness! Love owls – these are just too, too cute! Amazing job, Marian! 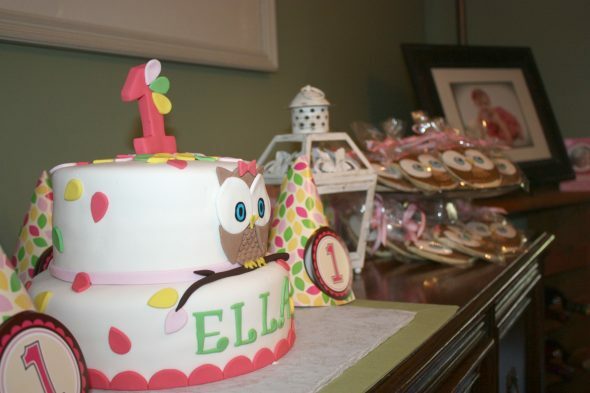 Marian: Love how the whites in the owl’s eyes match the sparkle in Ella’s. It’s easy to see why you picked that graphic. 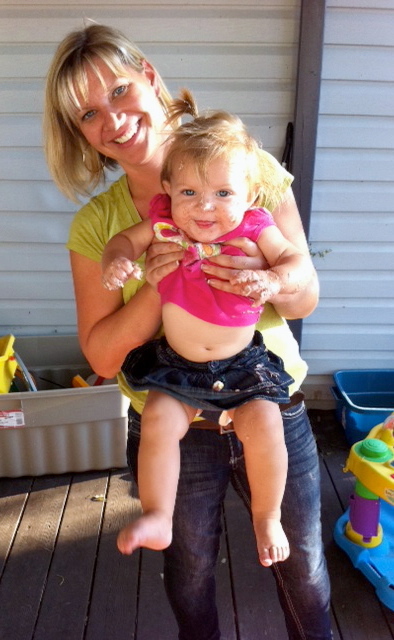 The “after” photo of her with her sticky hands is ADORABLE! Thanks for sharing. Happy Caking! i simply love your work!!! plz can u tel me how do u transfer the icing on to the cookie? Aww, Ella is so cute! These cookies and the cake are super nice. They’re awesome, @ Kris from So Cute Cookies! Thanks for sharing! Thanks, @ Maria Theresia, have a good week too! @ Sommer @ ASpicyPerspective: Merci! Thanks, @ IFeelCook! Hope you’re doing well. You truly inspire me to make cookies. These are just too cute and adorable. I really hope one day I can at least come a little close to what you create. LOVE owls and those cookies are magnificent! My best friend is owl OBSESSED. I’m going to have to try and recreate these for her birthday next month… you might be getting a “send help!! !” email haha. 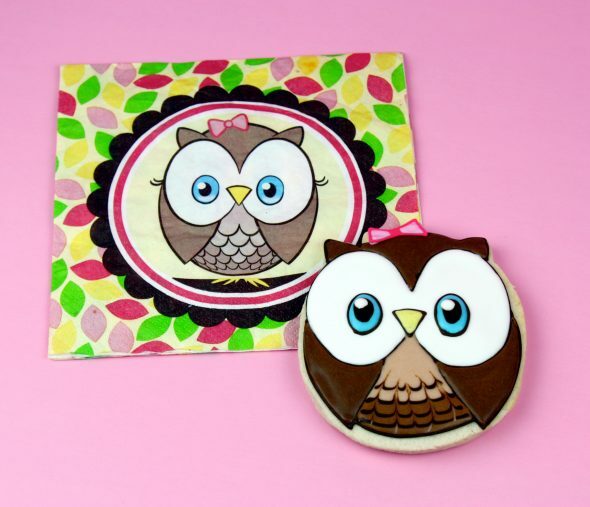 Love the owls and perfect for a birthday bash! OH my gosh!! These are the cutest ever. 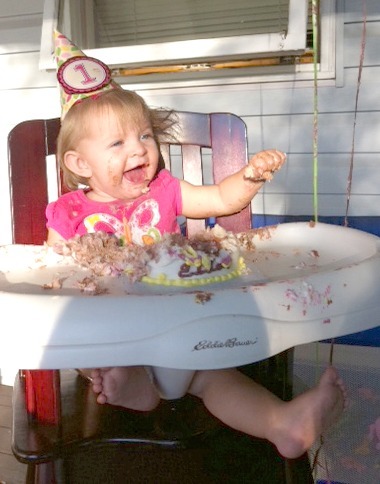 And I love the cute Ella with her cake . What a sweet auntie you are! would it be weird to have these at my 27th birthday – because I totally LOVE them! Marian, do you let your icing sit overnight sometimes in the tubes? Do you find it keeps its consistency overnight? I’ve wondered if I kneaded it in the tube before use the following day if it would pipe well. 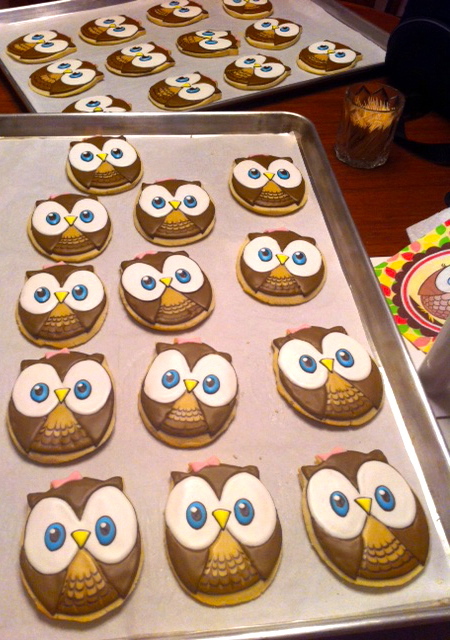 Your niece is precious as are these owl cookies! So cute and what amazing detail on them! Oh Marian, these are the cutest cookies! These owls are so stinking cute! Not weird at all, @ Gaby! I’m still a kid at heart and am thinking that if I haven’t changed by now, I probably won’t! Ha ha, I know, @ Julie Bell! Let me know what theme you’re doing – would love to make something! Hi @ Sherrie: I compare the two models at the bottom of this post here; http://sweetopia.net/2010/06/decorating-cookies-with-a-kopykake-projector/ Hope that helps! I’m doing this theme for my daughter’s first birthday. Can you tell me where you found the cookie cutter?